Life is yet again making a major intrusion into such frivolities and luxuries like baseball cards and breathing. As a consequence, my participation in the card world suffers mightily. That's about all you'll get out of me because I do not like mixing professional me with the 12 year old lurking inside of me who is waiting for a pack of 87 Topps. So, I'll have to return to the old standby of cards that never were. I have a semi backlog now, and it seems to be sufficient blog fodder. Moving on, today's candidate is the great Frank Robinson. Frank has one of the few distinct honors of being dissed in not one, but two sets of Topps cards. Apparently Topps thought a tiny head shot of him on the team cards was sufficient for a Hall of Famer, but I disagree. 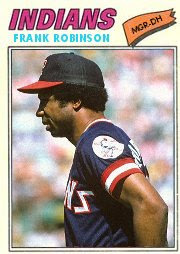 Mr. Robinson was one of the best to ever play the game, and he would second that comment in a heartbeat. Always overshadowed by Aaron, Mays and Mantle, Robinson never really got his due. Sure, he was (in my opinion) the Barry Bonds of the 50s, 60s and 70s. Not because of ROIDS, but because Frank does have a rather acerbic personality. Because he was black that he had to prove himself as a player manager first? Don't you think it is a pretty high compliment to say "we think you're so qualified to manage that you can handle a part time job as well."? The photo works very well with the 1977 design. It looks like a number of the photos in that set. You need a facsimile autograph on that 1977. 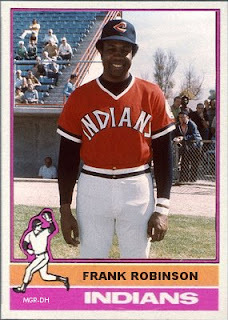 I know the 1976 comes from an Indians postcard, nice color on it, although that's a pretty dull pose, even for Topps.